You are currently browsing the tag archive for the ‘Sasha Viazmensky’ tag. As part of BAGSC’s 20th Anniversary Celebration, we wished to start a scholarship fund to reach out to promising artists and foster their development as botanical artists. Congratulations to Irina Stolyarova, Natasha Zueva and botanical painting students from Russia! 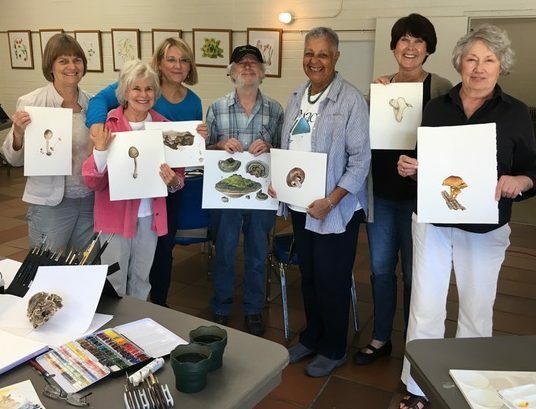 We warmly welcome Irina and Natasha as new members to our Botanical Artists Guild of Southern California (BAGSC) group. Irina and Natasha were chosen by a committee headed by their teacher, Alexander Viazmensky (Sasha) to receive scholarships offered by BAGSC. Each scholarship includes a two-year membership to the American Society of Botanical Artists (ASBA) and BAGSC starting in 2018, plus a $100 gift. Irina Stolyarova lives in St. Petersburg. She graduated from St. Petersburg State University of Culture and Arts as a librarian and bibliographer. She works as an economist/accountant. Irina has attended classes in botanical painting with Sasha since 2016. Cactus, Irina Stolyarova, © 2017, all rights reserved. Hydrangea, Irina Stolyarova, © 2017, all rights reserved. Pomegranate, Irina Stolyarova, © 2017, all rights reserved. Rose Hips, Natasha Zueva, © 2017, all rights reserved. Peonies, Natasha Zueva, © 2017, all rights reserved. Cotton, Natasha Zueva, © 2017, all rights reserved. A warm welcome to BAGSC and ASBA! 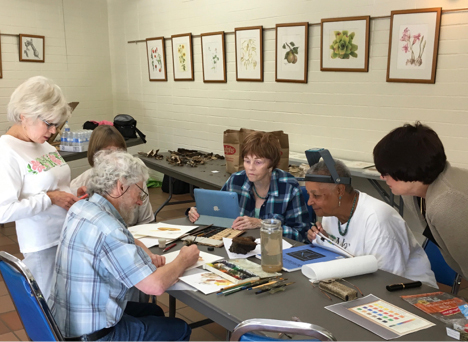 Last April Alexander Viazmensky (Sasha) and his students held their first Botanical Art Exhibition in St. Petersburg, Russia (see the article on page 9 of The Botanical Artist, the journal of the American Society of Botanical Artists (ASBA) for June 2016, Volume 22, Issue 2, ISSN 1523-5165*). 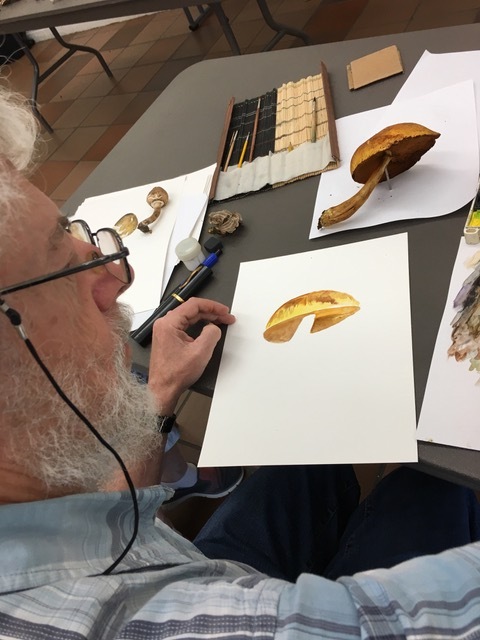 Sasha Viazmensky demonstrating initial watercolor technique for painting a mushroom. This October 19 – 21, 2016, Sasha came to teach a workshop about painting mushrooms for BAGSC artists. Held at the Los Angeles County Arboretum and Botanic Garden in Arcadia, California, Sasha brought with him a wealth of knowledge on his speciality. His technique is largely wet on wet. He reiterated often that we should get ready to put the paint on the paper, then STOP and think about where we will place the paint before proceeding. One thing we learned to observe is how many more gills appear at the edge of the mushroom that are thinner and closer together than the ones near the stem. Sasha was an excellent and affable teacher. Each day we watched him demonstrate the techniques for different types of mushrooms. He spent a great deal of his time individually guiding each of us. * The Botanical Artist is a quarterly publication for members of ASBA. Back publications are available to members for purchase. View a sample of The Botanical Artist. Sasha demonstration of a Polypore Mushroom (fungi that grow on tree trunks). Beth Stone, Gilly Shaeffer, Olga Eysymontt, Sasha, Cynthia Jackson, Janice Sharp and Bonnie Ash (missing from the photo are Pat Mark, Kathy Morgan and Jude Wiesenfeld). These are examples of our work! “Forest Bouquet, Russian Choice,” watercolor by Alexander Viazmensky, © 2016, all rights reserved. 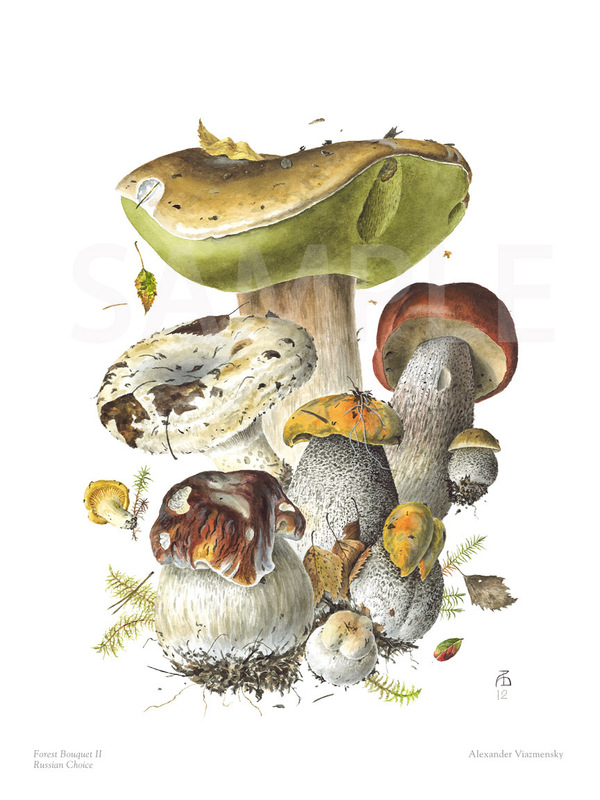 Alexander (Sasha) Viazmensky will be returning to Southern California from St. Petersburg, Russia to teach a three-day, BAGSC-sponsored workshop, Mushroom Portraits in Watercolor. How to properly place your subject: lights, shadows, reflections. Creating the shape from light to dark. Creating various textures with dry brush. Send a check for your $50 non-refundable deposit fee (or payment in full), made out to BAGSC, to BAGSC Education Chair Jude Wiesenfeld. Please write “Sasha” on the memo line of the check. Payment in full is due by Monday, October 3, 2016. Bring your lunch, or purchase lunch at the Peacock Café, on the Arboretum grounds. The Los Angeles County Arboretum and Botanic Garden is located at: 301 North Baldwin Ave, Arcadia, CA 91007. Alexander Viazmensky in the woods. © 2016. Sasha Viazmensky was born and lives in St. Petersburg, Russia, and specializes in painting fungi. Although he has a Master’s Degree in Electrical Engineering, he has devoted his life to painting, studying, and picking mushrooms. His work is included in the collections of the Hunt Institute for Botanical Documentation in Pittsburgh, the Minneapolis Institute of Arts, the Shirley Sherwood Collection and the Komarov Botanical Institute in St. Petersburg, among others, and in private collections all over the world. 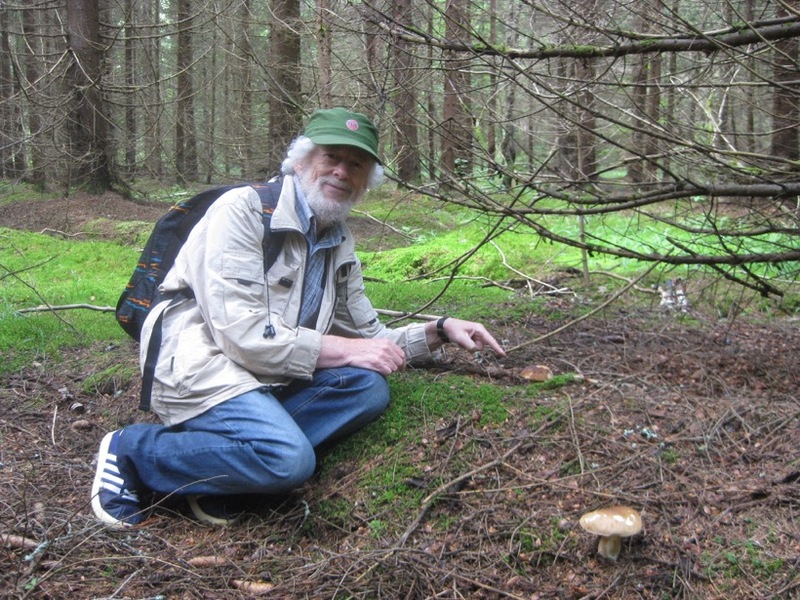 You can read an article Sasha wrote about picking mushrooms in Russia, published in MUSHROOM, The Journal of Wild Mushrooming, here.